Awesome Sauce, it's Furby Boom! 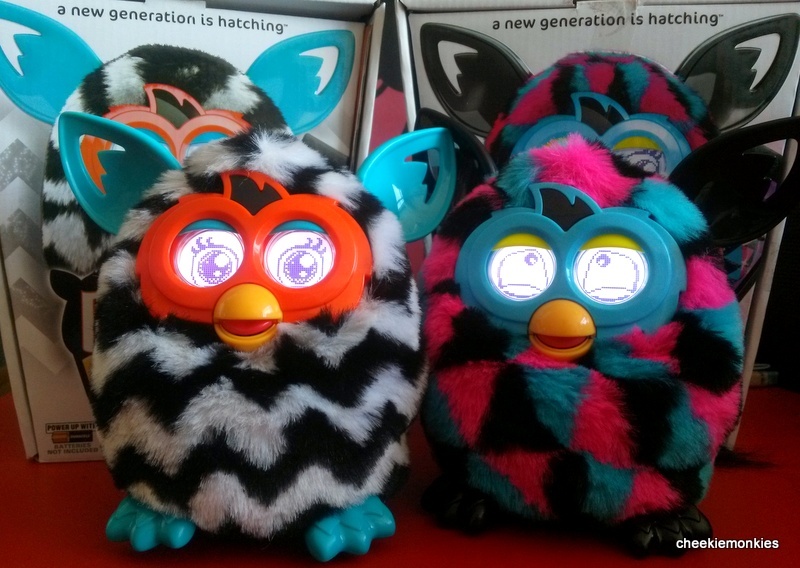 Last year, the monkies received the Furby reboot version and they immediately fell in love with it. Particularly for Ale, who remembered to cuddle it every night before bed and even placed it beside her come bedtime. So you can imagine her utter devastation when that Furby met with an untimely demise. I suspect it was the frequent dropping of the poor Furby onto the floor - blame it on Ale's small palms - and so, there came a day when he remained in a coma permanently. Ale was obviously shattered but time does heal wounds... until she got reminded of it again, all thanks to a brand new Furby launching in August! 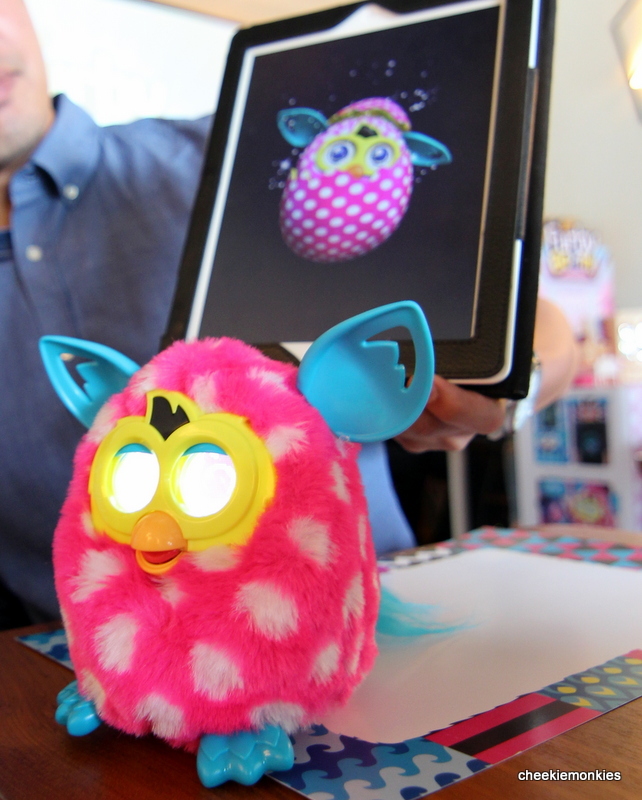 Say hello to Furby Boom, the 2013 version which would not only feature all the 'magic' and personality of its predecessor but also double the content. 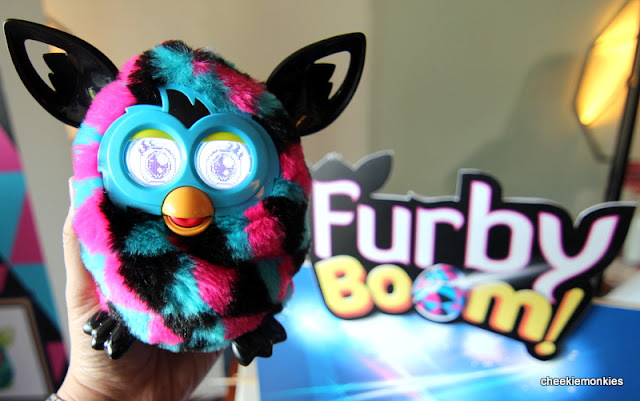 Externally, the new Furby Boom looks quite similar to last year's model, with the same glowing eyes (albeit more emotional options), moving beak and twitching pointy ears. The fur got an upgrade, however, with six "fashion forward patterns" of waves, zigzags and polka dots. A further 6 designs will be launched towards the end of the year. But it is the internal of the Furby Boom that has been souped up considerably, with the biggest change being a huge update to the free companion iOS and Android app. For starters, the Furby Boom has an enhanced memory function which allows it to remember the name that you give it, as well as the names of its other Furby Boom friends! As with all pets, the Furby Boom requires a fair bit of maintenance too. The app will display an interactive dashboard which monitors its well-being, including its health, hunger and cleanliness levels. Yes, pets take a dump in the virtual world too. So if your Furby Boom is feeling icky, just pop it down to the shower room and watch it physically react to the temperature of the water. But here comes my favourite part - watching Furby poop. The toilet bowl will actually slide under Furby Boom, followed by some rather cute constipated sounds and voila - brown cake. Well sometimes it is just poo, and sometimes it is a flower or other weird items. 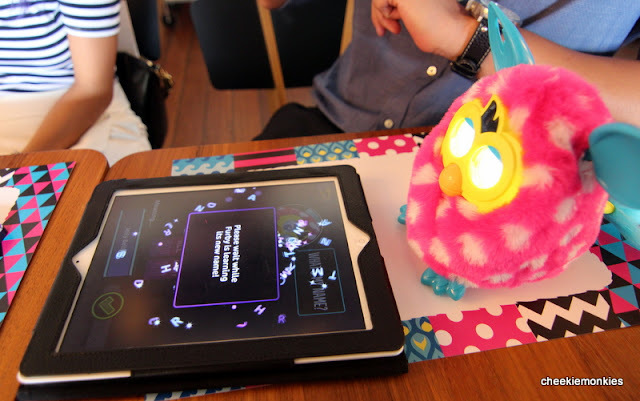 But the reason why Furby Boom is called as such is because it can lay a virtual egg, which in time will hatch and become a baby Furby, or Furbling, that will live and evolve within the app. You can collect over 50 eggs, and eventually unlock a whole Furby Boom city. You can also earn Furbucks to unlock extras, but parents can heave a sigh of relief - Hasbro says there won't be any insidious in-app purchases, and a child won't be able to buy Furbucks with cash. Which was probably why I felt safe handing over not one, but two Furby Booms to the monkies. 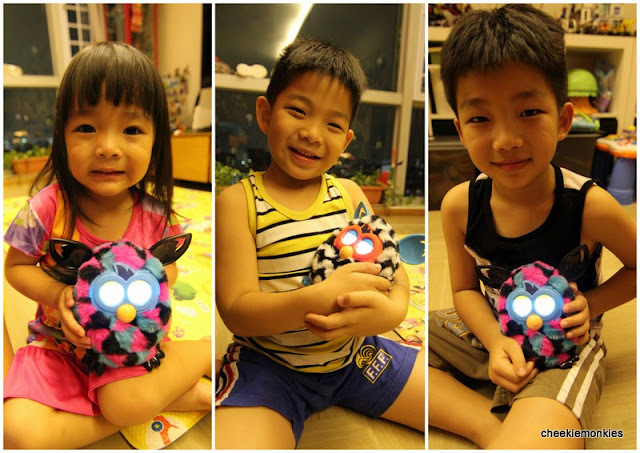 Yes, the kind people at Hasbro Singapore threw in an extra Furby Boom after they learnt how terribly distraught Ale was when our previous Furby kicked the bucket. So the moment Ash, Ayd and Ale laid their hands on those 2 talkative buggers, it was last year all over again. Petting their heads, tickling them, yanking their tails, tilting them upside-down, playing music to them - they did everything and more. The good thing is, Ale is treating the Furbies with the utmost care now... which only goes to show that instead of having three noisy machines at home, now I have FIVE. The things I put up with to please my monkies. 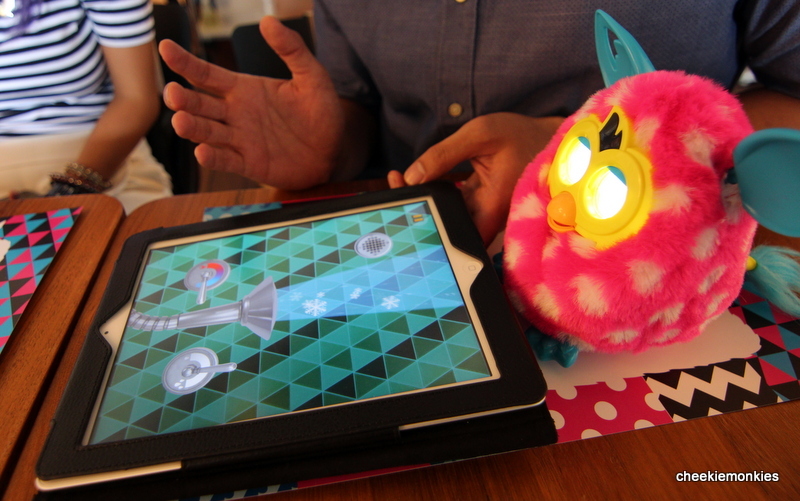 Furby Boom is priced at S$119.90 and will be available from 20 August 2013 at Toys 'R' Us, major department stores at Metro, OG and Takashimaya and selected Electronic stores. 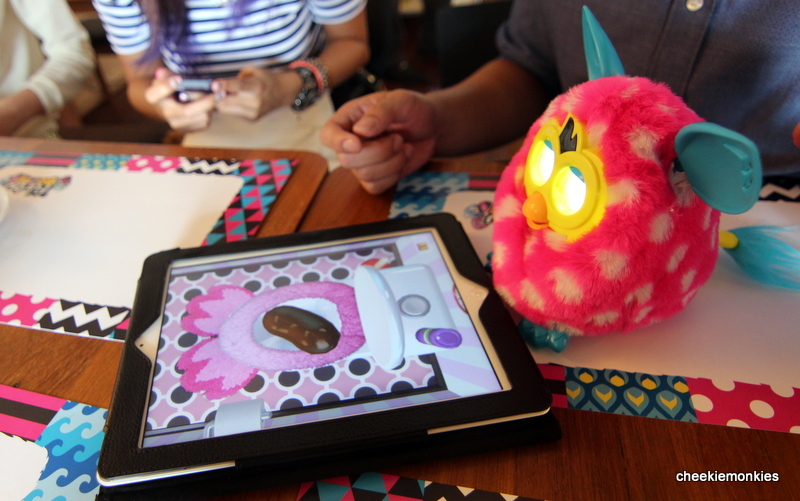 You can pre-order your own Furby Boom from 2-19 August 2013 at all Toys 'R' Us outlets. An exclusive Furby Boom goodie bag worth S$46.70, which consists of Furby Backpack, Furby 2014 Organiser and a Colour Marker, will be given for all pre-orders. You are also welcome to join in the festivities from 20 to 25 August 2013 at Toys 'R' US VivoCity to celebrate the launch of Furby Boom, with a day of fun-filled activities. Furby is the best interactive toy and think it will be the best toy for xmas! I love the Polka Dots !